This is a tasty Monday puzzle! The theme gave me a nostalgic and slightly hungry smile. 27a [Nickname for former N.B.A. star Darryl Dawkins] is CHOCOLATE THUNDER, one of the reasons for the 16×15 grid. 47a [Amy Adams or Emma Stone, hairwise] is STRAWBERRY BLONDE, the other reason. 56a [Kind of ice cream suggested by the starts of 21-, 27- and 47-Across] is NEAPOLITAN. 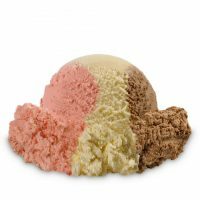 This is what I think Neapolitan ice cream looks like. Ah, childhood. 4d [Pudding ingredient] is TAPIOCA. I’ve spent too much time reading British books. I saw the T and entered TREACLE. I’m happy to see LEE at 10d clued as [Director Spike] rather than [General Robert E]. 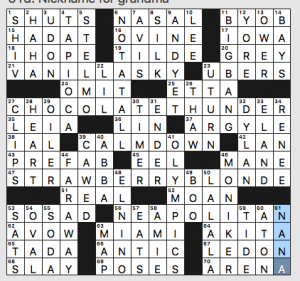 The only entry in this puzzle that really made me cringe was OWER at 13d, [One with a debt]. 50d [I don’t know the words to this part] is LA LA LA. That made me smile. I got 67a from crossings and couldn’t figure out who LE DON was. Turns out it’s [Enticed], or LED ON. Ah. What I didn’t now before I did this puzzle: I may have heard Darryl Dawkins’s nickname at some point but I’d forgotten it, so CHOCOLATE THUNDER sounded new to me. There’s so much I like about this puzzle! – The theme set is really tight. I can’t think of many other major forms of PAYMENT that could have gone into this puzzle aside from CREDIT, CASH, and CHECK. I also liked that the themers went down instead of across, to align with the wording of the DOWN PAYMENT revealer. Nice touch! – I really appreciate that JUNE CARTER CASH is given credit for co-writing “Ring of Fire”, even if she did have to be clued as Johnny Cash’s spouse instead of standing on her own. – We have a nice diversity amongst the proper names: ROSA Parks, KATE Spade, COLE Porter and TRU(man Capote). – I liked all the Ks and Xs throughout the puzzle (which were still gettable). It mixed things up a bit for a Monday puzzle. – I’d never heard of MOSSO [Meno ___: not as fast, in music] New word of the day for me! The one thing I didn’t like? NRA. For all the damage they propagate in our country, I would be happy if I never saw them in a puzzle again. Here in the Pacific Northwest we’re still in the depths of the biggest snow event in a decade. Four and a half inches fell on Friday here at Peredo HQ plus another couple Sunday night and more to come on Monday and Tuesday. Other nearby cities got up to 10 inches on Friday alone. It is most assuredly the end times, or as I’ve dubbed it, Rimenarok! My daughter wants MORE snow, my wife wants LESS. And that brings us to today’s puzzle. The revealer is MORE OR LESS at 58a [Roughly, and a hint to the words hidden in 18-, 23-, 36- and 52-Across]. The other theme answers hide either MORE or LESS. These work okay, but the LESS entries feel, well, LESS good. I don’t think I’ve ever heard the word SALES with SPIELS together. Usually I hear “sales pitch.” And BEATLES SONG feels a bit “green painty.” Would ABBA SONG or KISS SONG be valid as an entry (not for this puzzle, obviously)? I’ve been trying to time myself during my solves more often now, so I’m less inclined to stop and admire the grid while solving. Let’s see what we’ve got. EGO TRIPS, good. SCENARIO, not bad. ON TRIAL, ICE BATH, “DON’T GO,” “THAT SO?,” solid. And nothing beyond the pale as far as I can see. One clue did stop me cold: [Wine and dine] for 56d FETE (I put DATE). I am not familiar with this definition, only with its meaning of “festival.” And Merriam-Webster doesn’t list that as a definition either. The closest it gets is “to pay high honor to” which is not the same as “wine and dine” to me. Not a bad puzzle. I like the theme revealer, and I like the MORE entries MORE and the LESS entries LESS. Fill is solid to good. 3.3 stars. 17A [Plump stinger] BUMBLE BEE. 25A [First thing in the morning?] ALARM CLOCK. 63A [Popular jargon … or a hint to 17-, 25-, 39- and 50-Across] BUZZWORDS. This entire puzzle felt very clean. I’ll take a LEO I for such good fill as CAMEO ROLE, ADVICE GURU, GOOD KARMA, and NOBEL PRIZE (especially as clued). And although the themers aren’t exactly BUZZWORDS per se (they’re things that buzz), you’d have to be pretty nit-picky to pick a nit there. There wasn’t anything unenjoyable about this solve. Nice work, Sam! 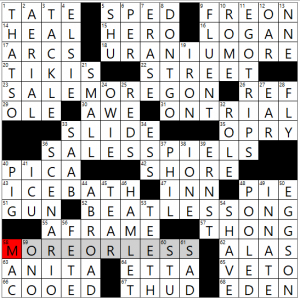 4.2 stars- fun puzzle with great fill. This is an especially dense theme for a 15×15 grid, which, given the anniversary nature of this puzzle, is fine by me. The rest of the grid suffers a little bit on its fill, but that tends to be how these things go. I’m not entirely up on my New Yorker writers, but I was aided a lot by having read Sharp by Michelle Dean, which profiles a number of notable female critics and essayists (including PARKER, ADLER, ARENDT, and KAEL) who often had their work featured in the New Yorker. The rest of the notable names I either knew from seeing elsewhere (Rachel CARSON‘s “Silent Spring” is something I’ve read before, as is E.B. WHITE‘s “Charlotte’s Web” and “The Trumpet of the Swan”), and I’ve seen Hilton ALS‘ byline before. Muriel SPARK was new to me (having only seen the movie version of The Prime of Miss Jean Brodie), but easily gettable from the crossing fill. All in all, I loved that (with a few exceptions), this celebrated the rich history of female writers in the New Yorker’s history. I also loved seeing the New Yorker’s house style gently poked fun at with the hyphen in TWENTY-FIVE being an integral part of the grid. Dreyer’s English, a new book on proper grammar and writing from the head copy editor at Random House, also jokes about this and is possibly the funniest/most engrossing book on grammar/usage I’ve had the pleasure of reading. Check it out! Please raise your hand if you too racked your brain thinking of the first verse of Buster Pointdexter’s “Hot Hot Hot”, only to discover there’s a section of “OLE OLE”s that precedes said verse. This entry was posted in Daily Puzzles and tagged C.C. Burnikel, Howard Barkin, Joe Deeney, Natan Last, Sam Buchbinder, Zhouqin Burnikel. Bookmark the permalink. Wonderful NYT puzzle! Smooth and clean. Hard to do on a Monday. Thank you, Howard! 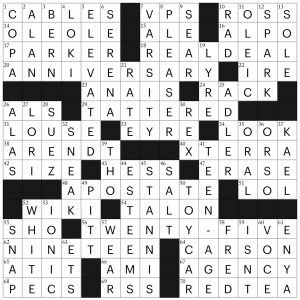 Today’s flavor is a 16×15 puzzle, so that 16th column is like an extra scoop for you today. 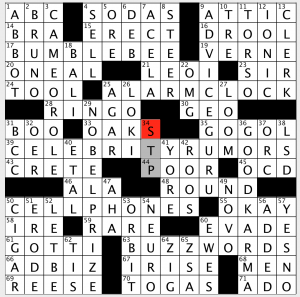 LAT 63a – For me it’s too soon for such a casual clue. What is the skill level of the Universal puzzle? I find them to be roughly Monday-Tuesday NYT (ish) in difficulty. New Yorker: I enjoyed this puzzle even though I prefer the New Yorker puzzle to be tougher than this one. I would have loved a puzzle filled with Dorothy Parker quotes. 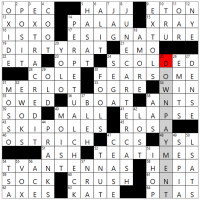 I was disappointed when I saw that the New Yorker puzzle had a theme, but it ended up being quite good. I’ll raise my hand & say my original thought on “Hot Hot Hot” was the completely different song from the 80’s made by The Cure. BEQ – There are 66 of the Anagram for Teniers in the puzzle. Anybody know what? I was thinking about it and entries works, but from the way he stated the clue I thought he was looking for phrase. ….